The market is just full of surprises, isn’t it? Just when I thought risk aversion would dominate for the rest of the week, NZD/USD popped up from a new 5-month low and rallied to .7450. I was expecting that U.S. dollar buying would carry on after the recent earthquake and tsunami in Japan. Little did I know that the Greenback was about to emerge as the new funding currency of choice. A quick shout-out to our resident economic weatherman Pip Diddy for clearing that up in his daily economic roundup… Props to you, dude! Thank heavens that I put a trailing stop on my remaining position, which means that the rest of my trade got stopped out right at the breakeven price of .7375. Whew! Shorted NZD/USD at .7375, closed half at .7350, closed the rest of my position at .7375. Kiwi? More like Ki-WEAK! 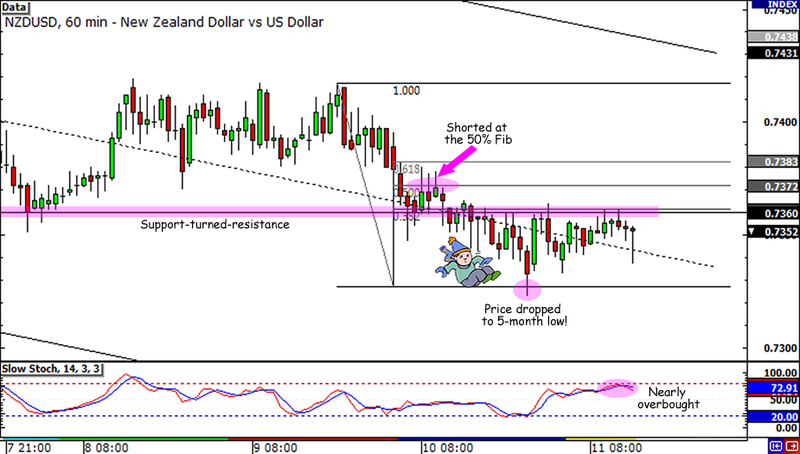 NZD/USD slid to a new 5-month low yesterday as risk aversion gripped the markets. Higher-yielders were having trouble staying afloat when disappointing economic reports started pouring in. First, it was Australia that surprised the markets with negative jobs growth for February. Next, China revealed that it suffered a trade deficit during the same month. Then, Moody’s credit rating agency decided to downgrade Spain’s debt. I bet they had that coming, but still… Did you see how traders started to panic and flee to the safe-havens after all that? I decided to lock in part of my winnings at the recent low of .7350 in case that level holds. The rest of my position I plan to keep open for the rest of the day, while risk aversion is still running high. Just a few minutes ago, I heard that Japan got hit by an 8.9 magnitude quake followed by a tsunami. While this fuels risk aversion even further, I’m praying for the victims of the natural calamity and hoping that it doesn’t get any worse. I read that several earthquake warnings have been issued to nearby countries, so make sure you stay safe! Since my last AUD/USD day trade was so much fun, I’m taking another shot at day trading this week! Early this week I finally decided to take one of the Fib plays that I’ve been pointing out in my last Comdoll Weekly Replays. I placed a short order at .7415 because it’s near the 61.8% Fib and a support and resistance area that I spotted on the 4-hour chart. And then, of course, there was the possibility of the RBNZ cutting its interest rates. 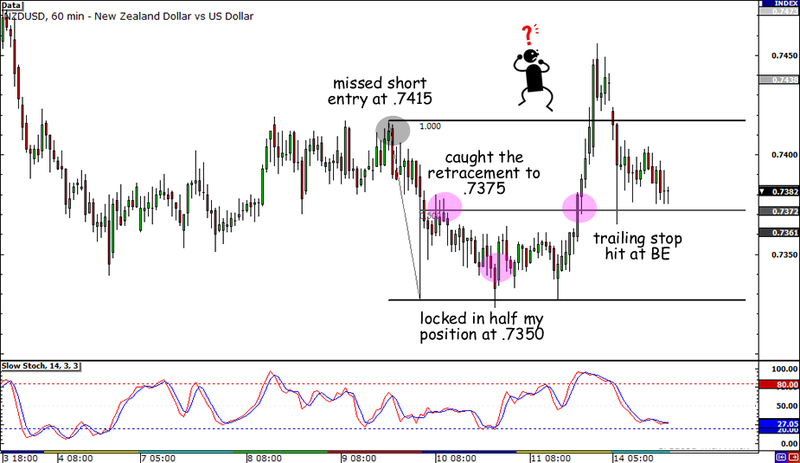 I had placed my profit target at the .7350 previous low in anticipation of a rate cut. As it turned out, the RBNZ did cut its interest rates not just by 0.25%, but by 0.50%! That’s twice my projected rate cut! I was practically grinning when I checked my charts, thinking that I was probably up by a whole lot. But nooo… As it turned out, the pip spread caused my trade to miss my .7415 entry by a half pip. A HALF PIP!!! Can you feel my frustration here?! And to think I ditched my friend’s pool party just to put up my charts. Good thing I had my trusty dose of milk tea to make me smile! After some reflection, I decided to just enter at a different price. After all, fundamentals is still on my side of the trade. No other major economic reports will be released from New Zealand for the rest of the week, so I’m betting that the Kiwi bears will hold on to RBNZ Governor Bollard‘s words when he projected a weak New Zealand economy for at least two more quarters. I decided to wait for a bit of retracement and enter near the day open price, which lined up with the 50% retracement level on the most recent breakdown. That former support around .7375 looks like it’s gonna act as resistance! Also, I hear that the dollar is still the king of the pip streets with all the risk aversion going on in markets. No major reports came out from the U.S. for the past few days so my bullish friends have been busy staying in tune with risk appetite. Let’s hope today’s trade balance and jobless claims reports in the U.S. bring me some pips! Markets are currently speculating worse figures for both reports, but I just might close if they print in the green! 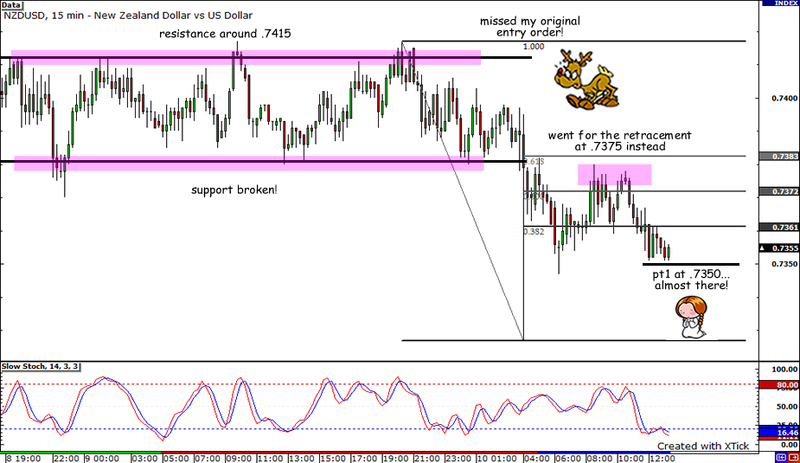 Short NZD/USD at .7375, stop loss at .7400, lock in some of my profits at .7350 and trail my stop at that point. As always, I’ll risk 0.5% of my account on this trade. I’ll be posting some of my thoughts about this trade through my Twitter account. Follow me there if you don’t want to get left behind! Ciao!